Pineapple and pizza are a food combination some consider an abomination; it’s certainly not Italian. 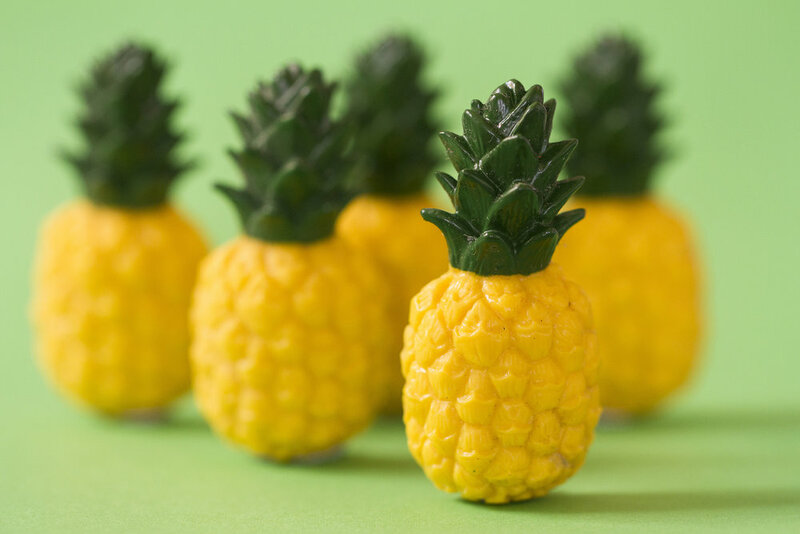 Pineapples have become an integral part of the New Zealand diet: pineapple rings in hamburgers, crushed pineapple in toasted sandwiches (with ham and cheese, please), and – confession time – I love pineapple lumps and just hope they taste the same when production moves to Australia next year. Although pineapples can be grown in Northland, they don’t fruit in New Zealand and most of our supply comes from the Philippines. I don’t know much about gardening, especially tropical plants, but I’ve learnt that weeding around pineapples is a blood sport as those spikes mean business; and the plants produce only two pineapples in their life cycle. Sometimes they’re harvested a bit early so, as they don’t ripen after picking, smell before you buy and select one with a sweet scent. My mother used to check for ripeness by pulling a leaf from the fruit’s crown, but that’s no longer possible as these days pineapples are sold with their crowns removed (ostensibly for biosecurity reasons). Because the fruit is sweet yet acidic, it works well in sweet-and-sour dishes or in stir fries with salty oyster or soy sauce. But keep fresh pineapple away from dairy products because it contains bromelin (an enzyme), which makes dairy products separate and stops jelly from setting. Canned pineapple is fine because the canning process destroys the enzyme. Bet you didn’t know that! The fruit is a great source of good things like vitamins B1, B6, and C; plus fibre, manganese and copper but now they’ve moved to our living rooms; a highly fashionable interior decorating feature, often heavily gilded. As one journalist asked in Britain’s Independent earlier this year, “why does every millennial (people born in the 1980s) seem to have a gold pineapple in their home?”. Over the past few years, gilded pineapples have popped up almost everywhere. Social media helps broadcast trends, so something like a gold pineapple (eye-catching, glamorous and bold, yet inexpensive) suddenly appears everywhere. Other current fads, like drink trolleys and flamingos, probably won’t be fashionable in a year’s time – remember avocado bathrooms? One enterprising UK bathroom company ran an ‘avocado amnesty’ earlier this year, as 75% of UK homebuyers demand a price reduction for a property with an avocado bathroom suite – one of the most hated pieces of interior design from the 1970s. I’m not sure New Zealanders really embraced sludge-green baths; one upside, perhaps, of our restricted choices due to the tyranny of distance, and a small population. Christopher Columbus introduced the pineapple to Europe in 1493, having discovered them in Guadeloupe. Europeans thought the strange fruit’s abrasive, segmented skin looked a bit like a pinecone, and its firm interior pulp like an apple: the ‘pineapple’ had arrived. Refined sugar was expensive at the time, and the pineapple was an instant hit with European royal courts, although it was another 200 years before gardeners perfected a hothouse method for growing the tropical plant. Even then, the pineapple was so rare and coveted that King Charles II posed for an official portrait receiving a pineapple as a gift; a symbol of royal privilege. But it’s not just the taste. Pineapples have been a decorator’s favourite for centuries, swiftly becoming a favourite motif of architects, artisans and craftsmen; used for gateposts, door knockers, curtain finials, and serving dishes. Pineapples are also a traditional symbol of hospitality, particularly in the US. New England sea captains brought them back from the West Indies, spearing one on their gate to let friends know they were home safely, and welcoming them to visit. It wasn’t long before people started carving pineapples into doorways and gateposts. In the Deep South, pineapples were also highly symbolic. Back in the Scarlett O’Hara era, transport restrictions meant guests stayed for far longer than today’s three-day-maximum rule. They were presented with a welcoming pineapple on arrival, and another when the host wanted them to leave. The pineapple was sliced in half and placed on the guest’s bed – an unspoken signal that it was time for them to pack their bags. So, what’s the next interior design fad? Apparently, it’s the cactus and their spikes are far more menacing.